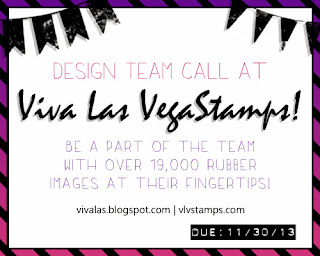 If you visit regularly you know I am a HUGE fan of Viva Las VegaStamps! and if you are a new friend stopping by head over and CHECK.THEM.OUT! The semi-annual design team call has been announced and I am throwing my hat in the ring…for me, being on this team would be FUN! Working with VLVS! products just makes me HAPPY and who doesn't want to be happy?? For the call I am going to be sharing three stamped projects and boy did I have a hard time picking what to share and narrowing it down to three, but I did so here we go. DeeDee over at VLVS! runs and hosts some FUN swaps! This was a matchbox swap we recently did. You’ll find three VLVS! images on this project: butterfly/spotted wing/sm, sm;)e and sunflowers. This page uses: line of chevrons, writing background, dancing lady, geo tag small, set of two hands pointing, writing arrow. This year for Halloween I made tags instead of cards. Tags are fast becoming one of my favorite projects to do. For this little trio of tags I used: spider on web line, spider, fancy spiderweb corner, bottle, mason jar, bottle, cemetery, infectious waste and spiked fence. Well there they are...thanks so much for checking out my entries and WISH ME LUCK!!! If they don't pick you they are crazy!!! Your tags are always amazing!!! AMAZING projects, Michele, as always! Even though I am also trying out, I truly hope and pray VLVS picks YOU!!! I honestly feel and believe you would be such an asset to their design team. Every time I see one of your VLVS projects, not only am I inspired by your talent and your projects, but I always end up ordering the VLVS stamp(s) you used if I don't have it. :) And GOOD LUCK!!! Four & Fabulous Blog Hop Winner!! !